Honey Apricot Pork Chops make an easy weeknight meal in less than 20 minutes. 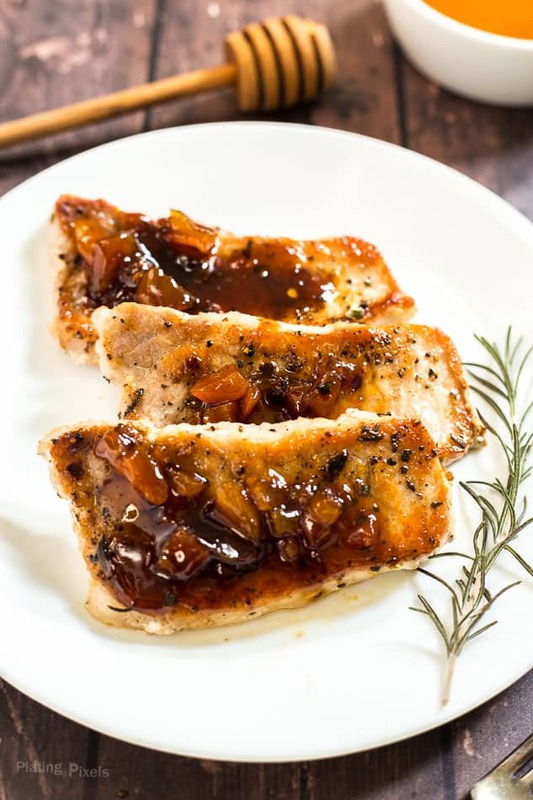 Juicy pork chops topped with a homemade sweet and tangy honey apricot reduction. Full of protein and is gluten-free for a healthy, comforting meal. Pork chops are a favorite comfort food of mine and were enjoyed often growing up. It reminds me of the quality family time over dinner. With the fall season here, I’ll be cooking plenty of cozy meals and creating more special memories. 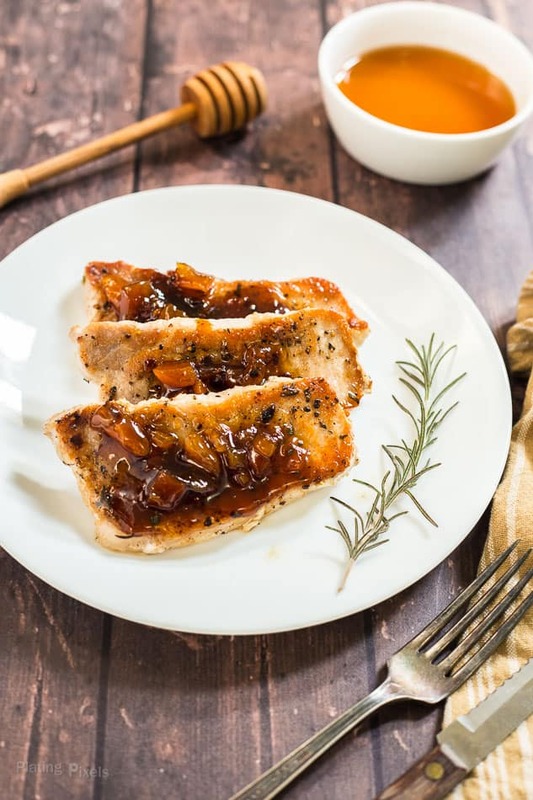 These Honey Apricot Pork Chops just may become a favorite of yours as well. Honey: sticky, sweet and delicious. A wonderful compliment to the pork. Here are a few of my favorite tips to make sure pork is juicy and cooked perfectly. Bring pork to room temperature before cooking, for 20-30 minutes. This will ensure more even cooking throughout. Be sure to not to overcook the pork, it seems obvious but it can be easily done. 4-5 minutes per side over medium-high heat is all that’s needed. Watch carefully and use a meat thermometer to check the desired internal temperature. Once cooked rest the meat 3-5 minutes before serving. If you cut into meat that hasn’t been rested, juices will run out and the pork will be drier. How to tell if pork is cooked? Pork chops don’t take long to cook through, especially if they are thinner. After about 4-5 minutes on each side, check the internal temp with a meat thermometer. For medium rare cook to an internal temperature of 145 degrees F. (followed by a three-minute rest). For well done, cook them to an internal temperature of 160 degrees. Rub pork with salt, pepper, and rosemary. Brown pork chops in skillet on both sides. Remove pork from pan and allow to rest. Drain any excess liquid but keep brown bits in the pan. Add white wine vinegar and cook until reduced slightly. Stir in honey, apricot preserves, chopped dried apricots, and red pepper. Cook until heated through. Serve honey-apricot mixture over cooked pork chops. Use high-quality pork, preferably without hormones, antibiotics or nitrates. The thickness of pork chops will affect cooking time. Add more or less time depending on thickness. Remember to rest the meat before serving. You can easily adjust the sweetness by adding more or less honey. Leftover pork can be used in salads, stir-fries or even sandwiches. Store leftovers in the fridge in a sealed container for up to 3 days. 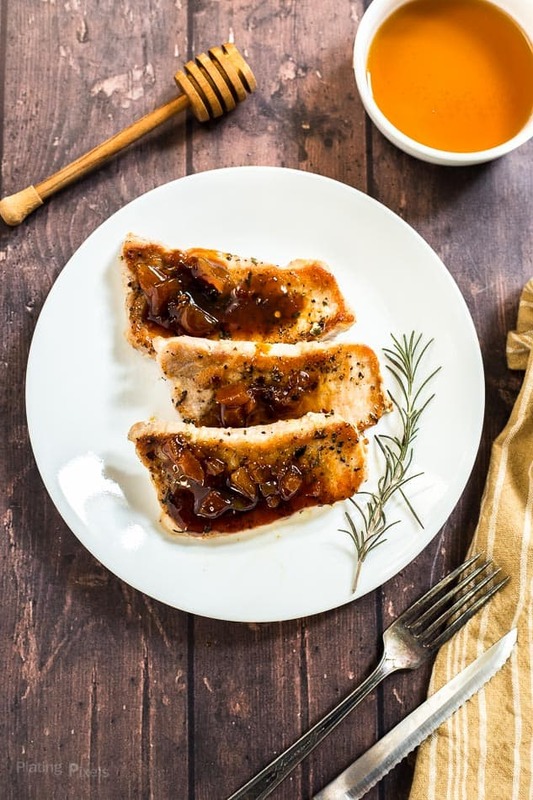 Flavorful pork chops topped with a sweet and tangy honey apricot reduction. Sprinkle pork chops on both sides with salt, pepper, and rosemary. Rub in to evenly coat. Heat olive oil to medium-high heat in a large skillet or pan. Add pork chops and cook 4-5 minutes until browned. Reduce heat to medium, rotate and cook the other side until browned. Pork should reach a minimum internal temperature of 145° F. measured with a thermometer. Remove pork from pan, lightly cover with foil and allow to rest. Drain any excess liquid but keep brown bits in the pan. Add white wine vinegar to the pan and cook on medium-high 2-3 minutes, until reduced slightly. Stir in honey, apricot preserves, dried apricots, and red pepper. Cook until heated through. Serve honey-apricot mixture over cooked pork chops. I really love pork chops, especially in such simple recipes like this. I love that you included temperatures instead of just cook times. Temperature is definitely the most accurate way to go. Thanks Carmella and glad all the extra tips were helpful for making this recipe. 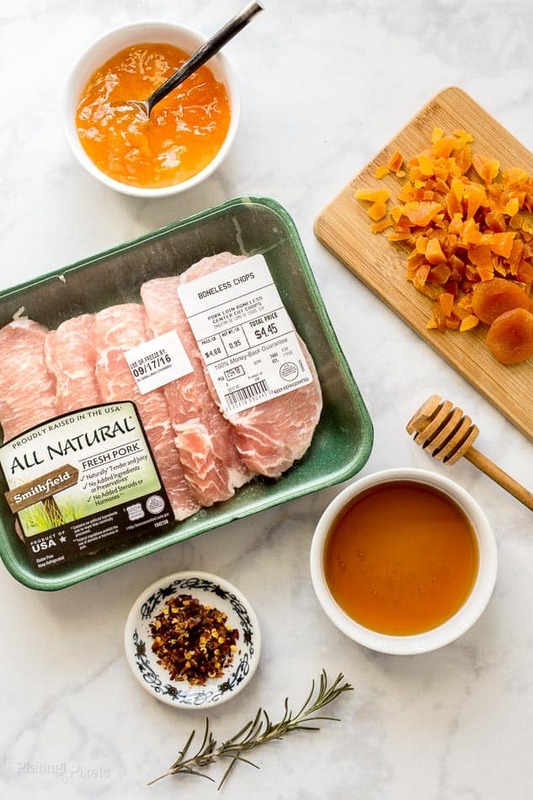 I love the combination of apricot with several different types of meats, but the addition of honey in recipe has be so intrigued – will be trying this one asap! My mom wanted some pork chop ideas and I sent her this. She loved it! Thank you for the great recipe! Aww that’s so sweet. Glad to hear that Liz and thanks! I love adding the apricot ! What a fun and delicious twist to traditional flavors. I will have to try this soon! The sweet flavor of the apricot sauce blended so well with the pork! Thanks so much for sharing this recipe! You’re welcome and glad you liked it Jessica! Super fab recipe. We love pork and the fruit goes sooo well. Beautiful post. I do love a sweet sauce with my pork and I can’t wait to try this delicious recipe. Excellent prize and what a recipe. Pork and apricots go so well together. I love apricot with pork! These sounds like a great weeknight dinner. My husband would SO love this. Honey and apricot sounds like a delicious combo with pork.